SPRINGFIELD – Legislation giving patients access to medical alternatives to prescription painkillers passed the Senate Executive Committee today. Senator Don Harmon (D-Oak Park) introduced the Alternatives to Opioids Act to tackle the opioid crisis, an epidemic that killed more than 60,000 people nationwide last year. The measure would allow people who have been prescribed opioids for a medical condition to apply for a temporary medical cannabis card instead. Melissa Burton-Sanders testified to the committee that using medical marijuana to treat her multiple sclerosis symptoms instead of opioids has been a blessing. “I am no longer in pain. I am a better parent,” said Burton-Sanders, a mother of five. “I am present for my children and that is worth everything in the world to me. Illinois created the Compassionate Use of Medical Cannabis Pilot Program in 2013 and is one of 29 states to have legalized medical cannabis. Senate Bill 336 passed the Executive Committee 16-1 and will now head to the full Senate for consideration. “Everything the governor said today is empty rhetoric if he breaks the promise he just made and again next month fails to present a balanced budget. “The more the governor speaks, the more obvious it is that he is living in an alternate reality. He talks about working together across the aisle, when his refusal to compromise on a balanced budget tripled our state’s debt and left us on the brink of disaster. “He talked again about decreasing property taxes. In reality, the only way to provide tax relief for middle-class families without causing more financial damage is to move to a fair tax system, something I’ve never heard the governor support. Senator Don Harmon delivered a speech to the AFSCME Council 31 2018 Legislative Convention in Springfield on January 27, 2018. 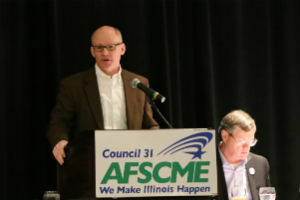 Harmon discussed the governor's efforts to sabotage contract negotiations between AFSCME and the State. He also shared his vision for an overhaul of the state's tax system, moving from a flat tax to a fair tax. "We must abandon the archaic system we have of rewarding the rich and abandoning the poor," Harmon said. "And supporting union workers is key to sustaining the middle class." 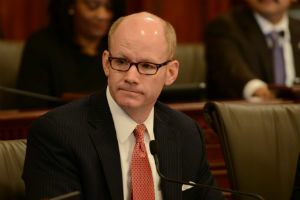 Harmon has introduced several measures in the past to amend the Illinois Constitution and allow for voters to take up the question of a fair tax on a ballot measure. 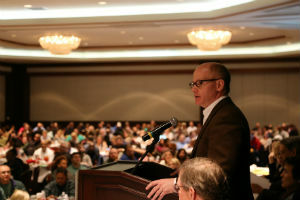 The annual convention drew hundreds of delegates from local unions across the state. 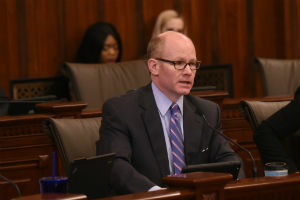 SPRINGFIELD – Senator Don Harmon (D-Oak Park) plans to introduce a measure aimed at tackling the opioid crisis by providing medical alternatives to prescription painkillers. The Alternatives to Opioids Act would allow people who have been prescribed opioids for a medical condition to apply for a temporary medical cannabis card instead. 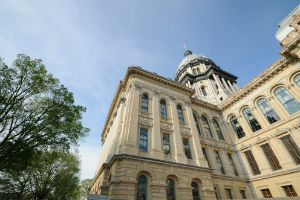 Harmon plans to introduce the legislation during the second week of the Illinois Senate’s veto session. Concern over the opioid epidemic is growing, as more than 60,000 people died of a drug overdose in 2016, more than the total number of U.S. soldiers killed in the Vietnam War. In Illinois, the opioid-related death rate increased 120 percent from 2014 to 2015, according to the Center for Disease Control and Prevention. Illinois created the Compassionate Use of Medical Cannabis Pilot Program in 2013 and is one of 29 states to have legalized medical marijuana.